Will cameras support both initiatives? - Will production switchers and audio devices support both signals? - How do each of these formatted signals multiplex or groom together into a single IP stream for transport? - How do they get spliced together into a single finished program stream or file? - How do editing applications address ingesting live content? - Does metadata get replicated, synchronized or forgotten? And Please address Sync and Timecode. For the next five years, EUROMEDIA will continue to draw upon its technical and human resources in order to provide France Télévisions with the necessary RF means to cover the largest cycling event in the world, the Tour de France, as well as the Paris-Nice, Critérium du Dauphiné, Paris-Roubaix and Paris-Tours cycling races. The decision taken by France Télévisions reflects EUROMEDIA’s renowned expertise and technological developments in RF (wireless) broadcasting since many years, in partnership notably with France Télévisions and Amaury Organisation (ASO), organisers of the above-mentioned races. Designed from the ground up as a fully integrated facility, Sneaky Big offers a setting for television and commercial shoots, rehearsals and recording sessions, web/media production, press conferences, corporate training, audio recording, sound design, music, videos, photography and all post production needs including editing and color correction. Serving Southern and Central California, KCET operates from a state-of-the-art broadcast facility in Burbank. The public broadcaster also rents out its studio space, which includes an innovative virtual studio. Within these facilities, KCET users the Artist system to link two control rooms, two production stages, 15 edit bays, tape rooms, master control/on-air operations, transmission, and an insert studio. Six Connect Duo telephone hybrids serve as an interface between the Artist intercom system and ISDN and PSTN public telephone networks, providing a valuable connection to the outside world during live broadcasts. The Riedel Artist system is also integrated with KCET's Telex BTR wireless systems and with its Harris Platinum SDI router via a MADI connection, the latter allowing KCET to connect any audio source directly in and out of the Artist frame while keeping signals in the digital realm. 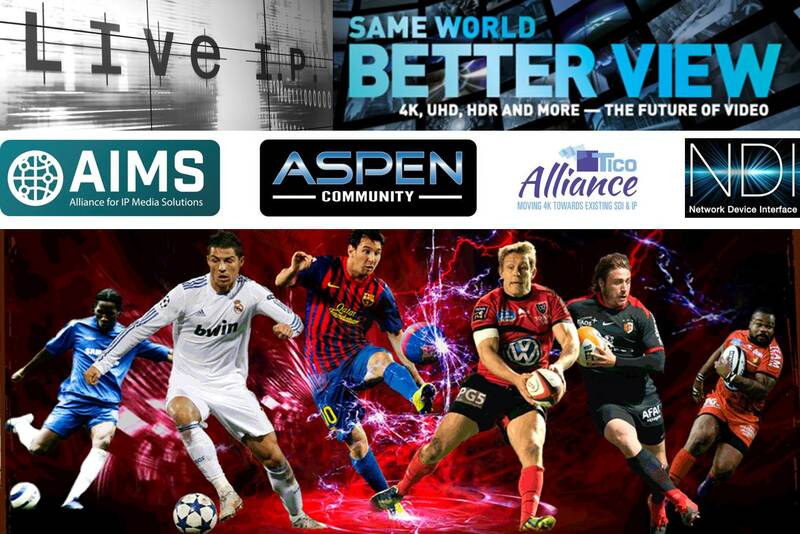 Viaccess-Orca, a global leader in the protection and enhancement of content services, and the French TV channel TF1 announced the broadcast of the world's first live stream of a football match in 360 degrees and Ultra HD (HEVC-encoded), showcasing a premium television experience with virtual reality (VR) technologies for a test audience. On March 29, this private audience enjoyed a football match between France and Russia in real-time, from three remote locations, using VR headsets. A recording of the live broadcast will be shown for the first time as part of Viaccess-Orca's "Virtual Arena" demo at the 2016 NAB Show, April 18-21 in Las Vegas. Belgian lighting designer Carlo Zaenan of QBE created another amazing live show in Benelux – it’s all happening there - using a rig that included 256 Robe moving lights – the 2016 leg of the ‘Symphonica in Rosso’ concerts, six performances presented by Dutch superstar singer Marco Borsato at Amsterdam’s 17,000 capacity Ziggo Dome. Carlo has worked with Borsato since 1999 and since 2011 has been his regular LD and lighting operator. To develop the visual treatment for the 2015/16 Symphonica in Rosso, he worked closely with set designer Anne-Mari Ahola and Marcel de Vré, Borsato’s long term show designer as well as the video crew from Visual Solutions and content creator Tom van Gestel from Fabrique Fantastique. Described as “three-days of fast beats, loud drops, beautiful people, and so many lights” by Billboard, many of those luminaires used on Ultra Music Festival again bore the Elation Professional logo with well over 500 Elation products in action on several stages at Miami’s biggest EDM party of the year. Elation dealers AG Lighting, Zenith Lighting and Beachsound & Lighting were involved, supplying an abundance of Elation lighting for this year’s festival. Both the popular Carl Cox & Friends Stage and Ultra World Wide Stage featured Elation gear with lighting design by SJ Lighting, Inc. and structure and production by AG Production Services. UK dance band Underworld delighted fans with a short UK and European tour to kick off the live campaign supporting their much anticipated new album - ‘Barbara Barbara We Face A Shining Future’. Lighting was designed by Haydn Cruickshank (H) from Colour Sound Experiment, with the company also supplying all lighting equipment and the LED screen. H has worked with the band – whose music has stayed edgy despite their commercial success - for an impressive 23 years … he was first hired after an early tour with pioneering club and dance touring phenomenon, Megadog. Right from the start Underworld embraced multi-media visuals, a trend that’s continued throughout their live performance career. The previews will be maintained on a daily basis and the link NAB 2016 will always show the growing number of featured companies in alphabetical order. One of Europe’s leading broadcast service providers, has signed a four-year contract to harmonise its broadcast camera fleet with a major investment in Sony’s HDC-2500 and HDC-4300. This commitment to the HDC family provides EMG with the technology to stay ahead of the changing broadcast industry landscape, and extends the organisation’s partnership with a trusted solutions provider that understands the rapidly evolving market requirements. EMG has made the decision to purchase up to 350 units of the HDC-2500 and the HDC-4300 over the duration of the four-year contract, taking the broadcast provider to the next level of live production shooting, throughout its European subsidiaries. FUJIFILM Corporation (President: Shigehiro Nakajima) has announced that it will release the “FUJINON XK6x20” as a new addition to the lineup of 4K-compatible digital cinema camera zoom lenses in late June. Equipped with a PL mount*2, the most common format for cinema cameras, the “XK6x20” is a standard zoom lens that delivers T3.5*1 brightness for the entire zoom range from 20mm to 120mm. In recent years, the need for employing visual content that utilize mild bokeh created with high image quality and shallow depth-of-field lenses that are unique to cinema cameras has increased for shooting various scenes for commercials, concerts, documentaries and dramas. Comprimato, a JPEG2000 software codec toolkit provider announced it is providing its JPEG2000 software codec for Nokia’s revolutionary 360˚ virtual reality camera OZO. The output of the eight 2k x 2k sensors is lightly compressed and packaged into a single stream which Comprimato decodes in software for live monitoring and responsive post production to enable dynamic rendering and real-time views of videos shot. “Hardware-accelerated decoding was an absolutely critical part of our design specification,” said Guido Voltolina, Head of Presence Capture at Nokia Technologies.